Look at that poster. Seriously, just look at it. "In space no one can eat ice cream..." Does that sound like a movie that takes itself seriously? I mean, just look at the name! When you watch this, you're not going into it expecting anything but the most ridiculous movie possible. I hold this movie in high regard because it's a favorite amongst my friends from high school. It's a little sad but I'm pretty sure this would fall into our "instant classic" category. The one thing that always comes to my mind when I think of this movie is how terrified I was of it before even seeing it. 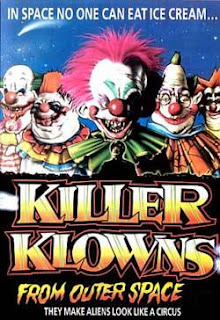 I would catch random scenes on Sci-Fi (no it wasn't SyFy then so I refuse to call it that) and the clown makeup alone would be frightening. Later in life when I discovered most of the budget was spent on said makeup, the rest of the movie made complete sense. Go into it with that in mind, and you'll find yourself laughing at how low budget and cheap everything but the clowns effects are.